Earvin Ngapeth hits past the block of Artem Volvich and Maxim Mikhaylov in the final of the 2018 FIVB VNL in Lille this year: They were opponents then, but the three have come together to lead Zenit Kazan in the 2018 FIVB Club World Championship. Lausanne, Switzerland, November 9, 2018 - Wide team rosters for the 2018 FIVB Men's Club World Championship which begins in just over two-weeks' time across cities in Poland are now confirmed - and they include a host of stars that have shone in competitions with their National Teams or clubs past and present. Hosts PGE Skra Belchatow will be led by Mariusz Wlazly, the 35-year-old opposite who was named Most Valuable Player at the 2014 FIVB World Championship for his role in Poland's first of their back-to-back world titles. 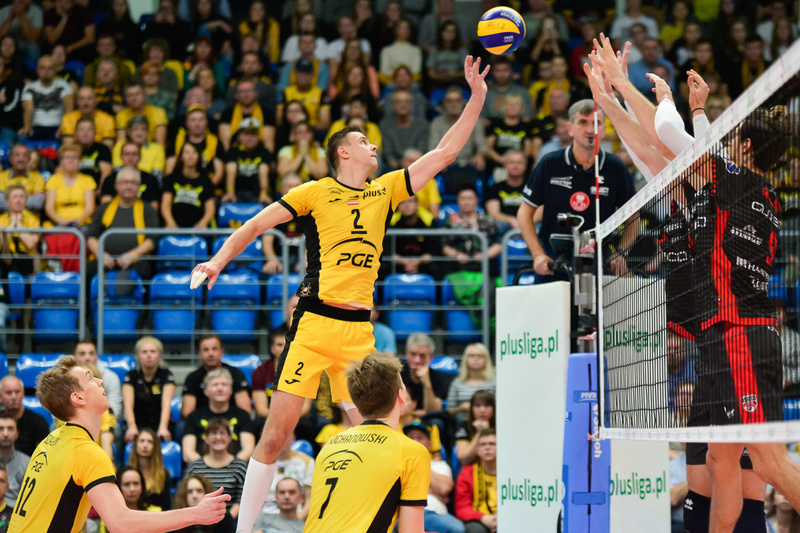 Mariusz Wlazly in action with PGE Skra Belchatow in the Polish PlusLiga. Although Wlazly retired from the National Team after that peak in his career, he continues to lead Skra for the 15th year running and has picked up a few more individual awards since, including MVP in the 2016 Polish Cup. There's more stars of world level MVP fame at the Club World Championship and defending champions Zenit Kazan of Russia feature two: Maxim Mikhaylov, who was most recently named MVP at the inaugural 2018 FIVB Volleyball Nations League in Lille, and France's Earvin Ngapeth, who was MVP in the last edition of the FIVB World League in 2017 in Curitiba. In addition, Zenit also feature USA's Matt Anderson, who was MVP in the 2015 FIVB World Cup - amongst other individual awards. Brazil's Sada Cruzeiro Contagem, who will be looking at reclaiming the title they lost last year to Zenit after back-to-back titles, feature a host of stars to see them tackle the task, including Rio 2016 Olympic gold medallist Evandro Guerra who will be going for his third Club World Championship medal after gold in 2016 and bronze in 2017. Evandro Guerra celebrates at the Maracanazinho as Brazil claim Rio 2016 Olympic gold. Sada Cruzeiro have also signed up two foreigners for the season, the Best Middle Blocker of both the 2017 World League and 2018 VNL Kevin Le Roux of France, alongside USA's Taylor Sander who was named on the Dream Team of the 2018 VNL as Best Outside Hitter. Russia's second entry in the 2018 Club World Championship, Fakel Novy Urenguy, includes two gold medallists from the country's recent success at the VNL: Dmitry Volkov (also Best Outside Hitter of the competition) and Egor Kliuka. Both were also instrumental in Russia's claim to the 2017 European Championship title. Dmitry Volkov (serving) and Egor Kliuka (ready for the block) in VNL action earlier this year in Lille: The two come together again to lead Fakel Novy Urengoy in the 2018 FIVB Club World Championship. Between them, the two Italian entries in the Club World Championship feature numerous stars that have shone with their National Teams or clubs in past FIVB competitions. Osmany Juantorena would be going for a fifth MVP title in the competition, after picking up the award three times (2010, 2011 and 2012) with Trentino and then again last year with Cucine Lube Civitanova which he will be leading again this year. Osmany Juantorena with his MVP award at the 2017 FIVB Club World Championship in Krakow. Robertlandy Simon will be alongside him, also a veteran of the Club World Championship, having already won silver with Qatar's Al-Rayyan in 2014 plus gold and bronze with Sada Cruzeiro in 2016 and 2017. The 31-year-old Cuban was named Best Middle Blocker in both the 2014 and 2017 editions. Also having made the move from Sada Cruzeiro to Lube is yet another Cuban-born star: Yoandy Leal, Club World Championship MVP in 2015, has won three gold (2013, 2015, 2016), one silver (2012) and one bronze medal (2017) with Sada Cruzeiro. Complementing the three on the Lube squad will be Rio 2016 Olympic gold medallist setter Bruno Rezende who moved to Lube this year from Modena. Meanwhile, four-time Club World Champions Trentino will get their playmaking from Simone Giannelli, best setter of the 2016 edition of the competition, when the club won bronze in Betim. The 22-year-old was a silver medallist with Italy at the Rio 2016 Olympic Games and 2017 FIVB World Grand Champions Cup. Simone Giannelli in celebration during the Rio 2016 Olympic Games, when he led Italy to silver. Serbia's Srecko Lisinac, recipient of numerous Best Middle Blocker awards, including when he helped his National Team win the 2016 FIVB World League title in Krakow, will be alongside Giannelli. USA's Aaron Russell, Best Outside Hitter of the Rio 2016 Olympic Games will be on hand to bring home Giannelli's sets, after the 25-year-old moved from Perugia to Trentino this year. And France's Jenia Grebennikov, consistently named Best Libero in world and continental competitions during the past four years, will be picking up the slack for Trentino after moving over this year from Lube. Most recently, the 28-year-old received the Best Libero award at the 2018 VNL, plus the 2017 and 2018 European Champions League. Damian Schulz is the only player from Poland's world-title-winning sqaud last month in Turin who features on Asseco Resovia Rzeszow - the country's second entry in the Club World Championship. However, Mateusz Mika, who won world gold with Poland four years earlier, also features for Resovia. And finally, Iran's Shahram Mahmoudi will be leading reigning Asian champions Khatam Ardakan in the 2018 Club World Championship. The 30-year-old has been named MVP three times in the Asian Club Championship, in 2014 (with Matin Varamin), plus 2016 and 2017 (with Sarmayeh Bank Tehran), before moving to Ardakan this year.